All Year Any reasonable time Mon, Tue, Wed, Thu, Fri, Sat, & Sun. 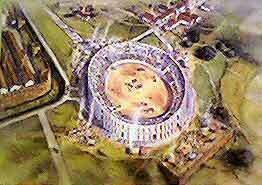 The amphitheatre was constructed about 70AD by Legion II Adiutrix. To replace an earlier wooden structure. 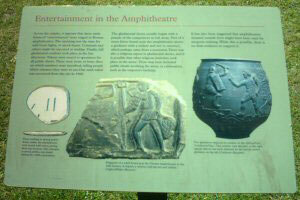 It would have seated about 7000 spectators. 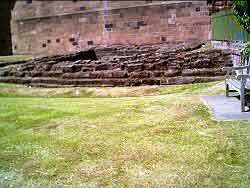 The Amphitheatre fell into disuse by the mid 2nd century. 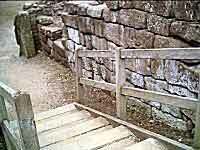 But was reinstated for a short time around 270 AD, possibly to celebrate a victory of the rebellious Britons. 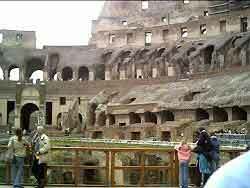 It was finally abandoned in the 4th Century AD. 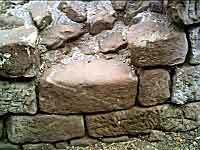 The structure was only rediscovered in 1929. In 1959 a new road was constructed around it. 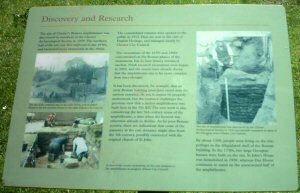 It was excavated 1960 - 1969. 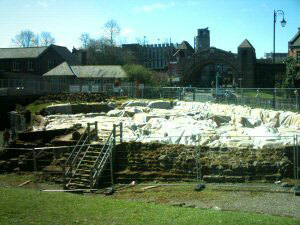 Only half the amphitheatre has been excavated because the other half has a listed building built over it. 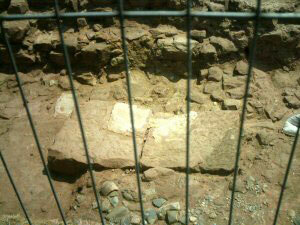 In the centre foundations of a wooden structure have been found. 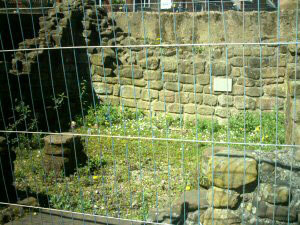 This may have been a temporary stage where executions were held. 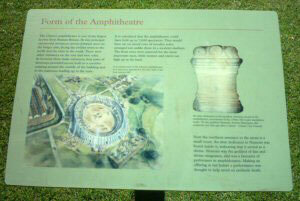 It has since been argued successfully by Keith Matthews that the wooden amphitheatre did not exist. 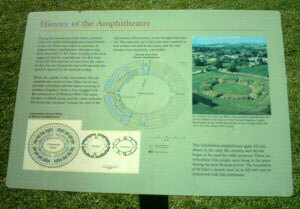 And the first amphitheatre built was smaller and made of stone and had wooden seating. 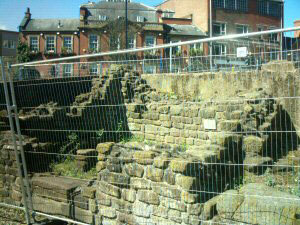 This was replaced by a larger more grand stone structure. 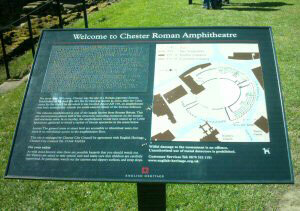 Chester's Roman Amphitheatre in Roman times. 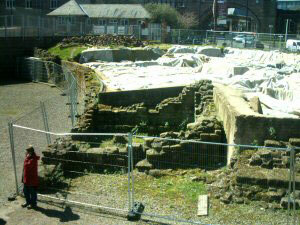 And below the Amphitheatre now. And then a model reconstruction in the Grosvenor Museum. 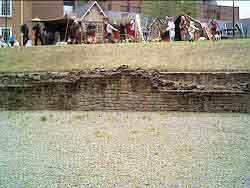 This is a model of the amphitheatre in the Grosvenor Museum. 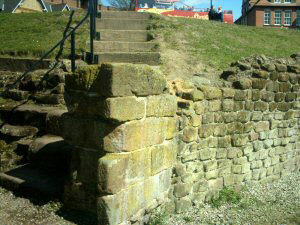 The amphitheatre is the property of	English Heritage. And entrance is free. 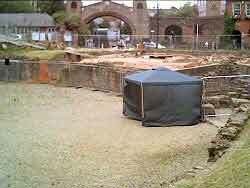 More excavations will take place in the summer of 2004. 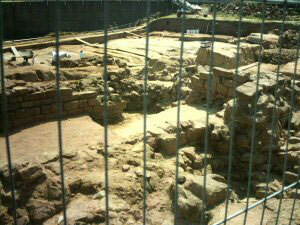 To get information on an even earlier bathhouse structure, traces of which were found under the amphitheatre. 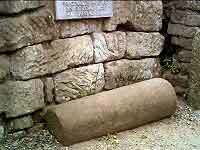 In the small room called the 'Nemeseum' to the side of the north entrance to the amphitheatre stood a replica of a small roman altar found during excavations. 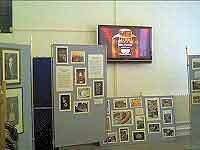 The original altar is on display in the Grosvenor Museum. Nemesis was the roman goddess of retribution. Nemesis was the daughter of Night. From her union with Zeus were born the Dioscuri and Helen, the cause of the Trojan war. Nemesis ruled over the distribution of wealth. She looked after balance, took revenge on arrogance and punished excess. She also condemned excesses of happiness, riches and power - indeed, of everything which threatened the equilibrium of the world and upset the order required by fate. She put people in their place and led Croesus, who was too happy and powerful, into an ill-fated expedition against Cyrus. 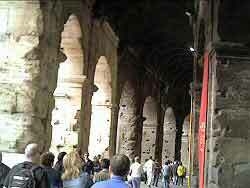 Rhamnus kept the most famous of the temples dedicated to Nemesis. 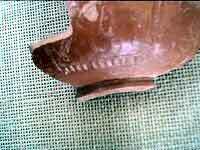 He testified to the immoderate behavior of the Persians, who were very confident of a victory over the Athenians. Nemesis prevented them from seizing the city, and, in a block of marble brought to celebrate the victory, Phidias sculpted a statue of the goddess. 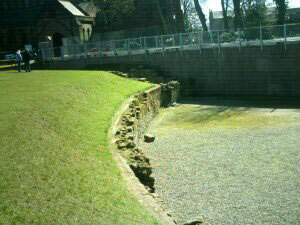 The Amphitheatre was positioned just outside the walls. 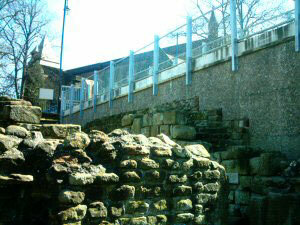 Close to the Southeast angle tower of the roman fortress. 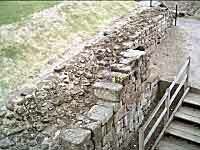 The foundations of this tower can still be seen. 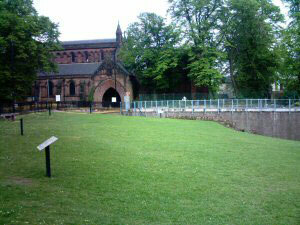 This photo shows the relationship between the Amphitheatre and the Church nearby. 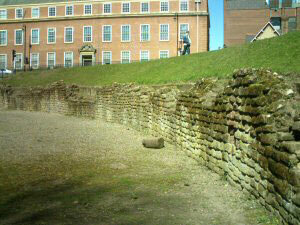 Close to the church side of the Amphitheatre are the remains of the steps leading to the Roman officer's seats. 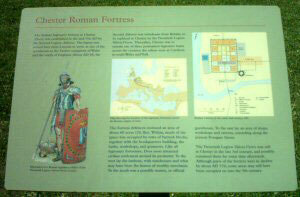 From this position to Roman elite would have watched the events unfold. 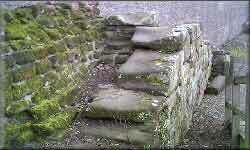 The steps are worn with use. 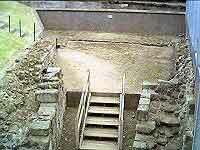 The alternative theory is that this is an early Church. And was replaced by the one near by. 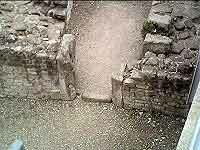 The Stone Doorway to the Arena floor from the East. 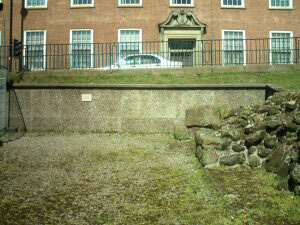 This small slate plaque was found in 1736 in Fleshmonger's Lane (Now Newgate Street) in Chester. Soon afterwards it disappeared, and only two cast copies of it were believed to survive. One in the society of antiquaries in London, and one here in Chester. 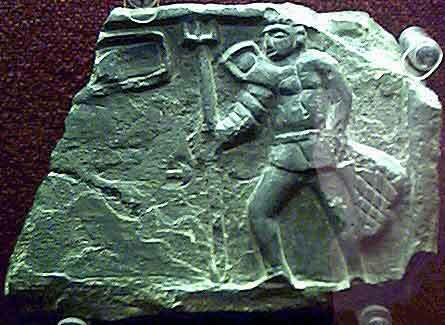 In 1978 Saffron Walden Museum in Essex asked the British Museum to look at a small relief of a gladiator which had been in their museum since 1836. 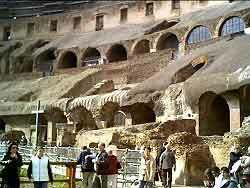 Their accession register says it came from Herculaneum in southern Italy. 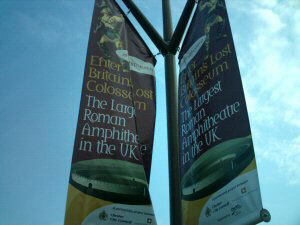 But after much research the British museum was able to show that this was indeed the lost Chester gladiator. 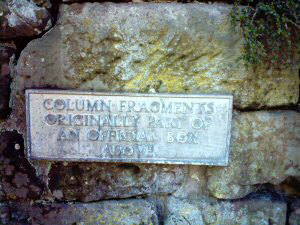 How the plaque found its way down to Essex remains a mystery. We know that it was in the collection of a London physician, Dr Richard Mead in 1742. 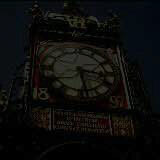 It later found its way into the possession of the reverend Thomas Hopkins of Linton, Cambridgeshire. 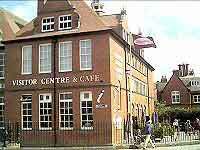 Who presented it to Saffron Walden museum, but by this time its association with Chester had been long forgotten. 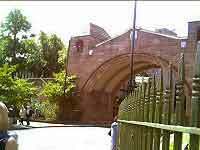 The stone comes from Minera in the hills of Wrexham. 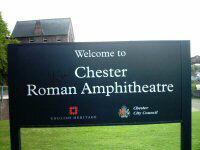 We believe that the Romans were mining for lead in the area, and useful pieces of slate must have been included in the shipments of lead sent to Chester. The surviving fragment is approximately one half of a rectangular panel showing a gladiator fight between a 'Retiarius' and a 'Secutor'. The Retiarius survives complete but all that we can see of his opponent is a shield held high in the air and the outline of his sword lying on the ground. However, with the help of a little detective work we can make a guess at what stage their fight reached, and therefore what the missing figure might have looked like. The Retiarius does not appear to be fighting, and if you look closely the dagger sheath on his belt is empty. It therefore seems likely that the Secutor has been seriously wounded by the dagger. The Retiarius has won and he is awaiting the verdict from the crowd. Either to spare his opponent or to finish him off. 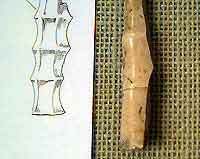 This bone Roman Gladius sword handle was found during the 2004 Amphitheatre Dig. 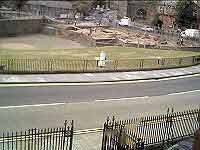 and you can see the archaeologists at work. 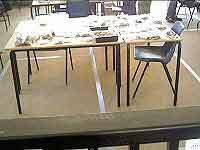 The finds are on display on the first floor of the Chester Visitor Centre. 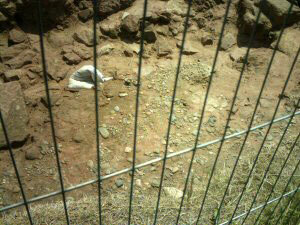 The excavation can be viewed from the finds room window on the first floor.